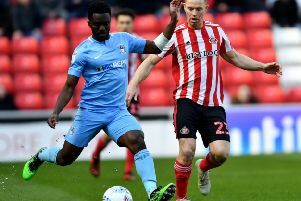 Jack Ross insists that Sunderland will not change their approach in the remaining five games of the season. The Black Cats shipped five goals against Coventry City on Saturday, in what was their first home league defeat of the season. With their rivals for second spot in League One all winning, it has raised the pressure ahead of a crunch pair of fixtures, against Doncaster Rovers and Peterborough United, next weekend. A change of shape against a threatening Doncaster side seems certain, but Ross said he would keep faith in the general approach of his team. “It’s not the way we train [to be more defensive], it’s not the way we prepare and it’s not the way we’ve been doing things since the start of the season,” Ross said. “Personnel wise, we have a lot of players that want to play on the front foot. We have to be conscious of that. I can understand that when you’ve been involved in a game where you score four goals and don’t win, questions are going to be asked. But equally, we’re 41 games into a season and we’re in a position where our destiny is in our own hands. “We’re in that position because we’ve played well, and to be in a position where you can get yourself promoted, you have to be a decent team. I think that’s sometimes overlooked, and I think it’s sometimes downplayed a bit because we’re Sunderland. The other teams at the top get told they’re good teams, but for us it’s just seen as par for the course. “We’ve got to this stage through trying to be as bold as we can be,” he added. “Sometimes we’ve only scored one goal in a game, but we’ve always tried to approach things that way. That’s not going to change, but at the same time, we’ll reflect on what’s the best way to play on Friday in terms of how we set up and how they play. Sunderland’s promotion fate remains very much in their own hands, with a game in hand on Barnsley and with fourth-placed Portsmouth still to visit the Stadium of Light. 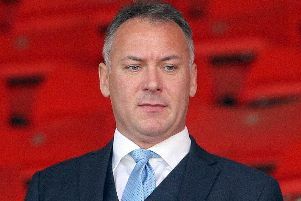 Ross knows the pressure on the Black Cats will be immense and urged his players to embrace that challenge. “We’ve spoken a lot about the fact that we’ve put in 41 games worth of hard work this season, and we don’t want to let that go to waste,” he said. “We’re in a position where we’re in control of that not happening, but it’s going to need strength of character and strength of mind. The players will be okay. There’s a soreness there at the moment, but by the time we come back into work again, it’s about preparing for Doncaster. “It’s a huge weekend for us. There’s no disguising that. I’ve also admitted that there is pressure here every week, but I’ve also tried to shield the players away from it a bit. We’ve spoken quite openly about it now though. “There’s going to be big pressure in these games coming up now, not just for us, but for all the teams that are competing for promotion. We’ve got to be able to deal with it. It’s there, but it’s why you want to play for a club of this size. It’s why you want to be challenging for promotion – if you don’t want it, play for a smaller club that’s going to be in the middle of the table.